← Previous Post happy st. patrick’s day! It’s all perfectly plausible, but if you confine your sample to people who live within 50 miles of where their grandparents came from, how representative can it be? And, where the devil has Shetland gone? Taffy was a thief ………..
Where are the Normans? or can I just not find them. I should have just kept reading the different articles. Anyway, does this mean that the Son Also Rises could not be tracking Norman genetic contribution? So the Welsh are supposed to have been there since the Ice Age. The Anglo Saxons did not supplant the prior population of Britons which were presumably also Gaelic speakers. If the Anglo Saxons only contributed 10 to 40% genetically then how did the English Language emerge from Anglo Saxon given that populations seem quite resistant to changing their language out of the blue? It leads to a problem. The vast majority have spoken English at least since we have written records to support that. So, how did English come to be spoken on a set of islands that supposedly originally spoken Gaelic? There appears to be no replacement populations. There was merely some mixing, probably with the changing administrative elites and their entourages over the course of history, but those groups were clearly minorities with force behind them. One could put forward the notion that the Gaelic populations are mass migrations that moved into the West coasts of the British Isles and slowly went into decline over the ages and the English speakers are the Ice Age population that arrived on the Islands on the inundations of the Celtic Shelf and Doggerland etc. Based on Albion’s Seed, I’m surprised not to see more distinction between Wessex and East Anglia. It’s also interesting that the North Midlands is such a diverse region, but strange if there’s no Scandinavian connection. Fischer suggests that Norse influence in that Northumbria/West Yorkshire region was culturally important. Also, if you have a copy of Albion’s Seed handy and want to see a nice correlation, check out the land tax map on p.449. It’s almost exactly the Brythonic regions in this this study, which makes me wonder how all those tax-averse, royalist (and presumably clannish) Britons turned into today’s die-hard Labourites. It’s disappointing that there wasn’t much evidence of the Normans, except insofar as it’s rolled in with that 11% Danish contribution. Maybe their descendants’ persistence in the upper classes meant they were less rooted, so they just didn’t show up in any regional concentration. It would be interesting to see if they were identifiable in an Irish study, either as Normans per se or through similarity to one of the other groups identified in this study. I’d also be interested to see if there’s an identifiable association between the North Welsh and Gaelic Irish populations, since it’s thought that there were a lot of Irish colonies in the region. IIRC, it’s been speculated that the name Gwynedd itself is either a cognate or Brythonicized (?) derivative of the Irish ethnonym Feni. dearieme: It’s all perfectly plausible, but if you confine your sample to people who live within 50 miles of where their grandparents came from, how representative can it be? It’s older British people all four of whose grandparents were born 30 miles from one another, isn’t it? Admixture per generation rates between these clusters would be interesting. I personally don’t find it terribly surprising that the Danish Vikings didn’t leave a distinct genetic mark. They were from same parts of the world as the angles and the Jutes. Just a few hundred years later. I would expect them to be indistinguishable. 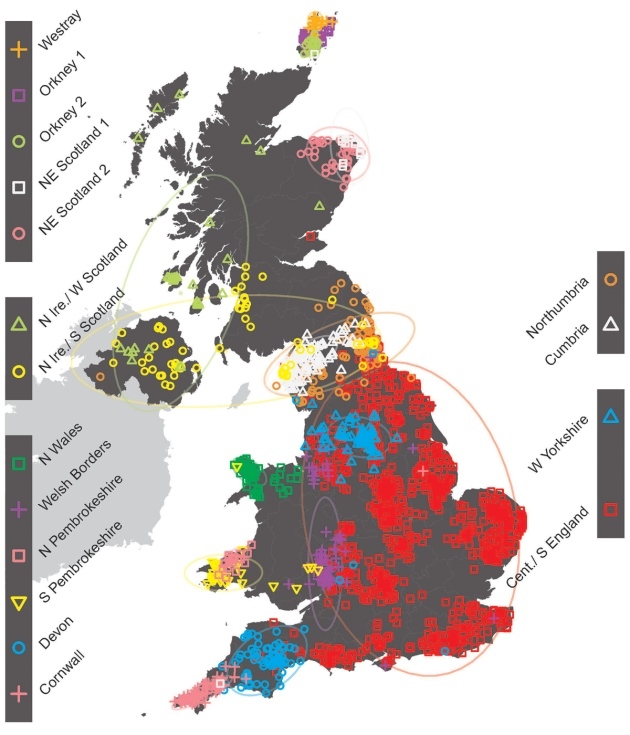 I noticed some time ago that the southern English share several HLA haplotypes with French and Belgians (and also northern Italians and potentially Swiss) relative to the Welsh, northern English, and Scottish. A number of these haplotypes appear to be of Near Eastern origin and show up in Greece, Turkey, Jordan, Lebanon [no data on Egypt]. They probably arrived in Europe less than 10kya judging by their lack of equilibration. It’s not clear whether their arrival in England occurred during Neolithic, Bronze Age, Iron Age, or Roman period. That’s going to require a lot of re-naming. More than one non-cau in the woodpile there. “the prior population of Britons which were presumably also Gaelic speakers”: no. The conventional wisdom was that they spoke the precursor of Welsh almost everywhere, though that needs you to assume (i) that the Pictish language was of the same group, and (ii) that the various Irish colonies also originated in the Dark Ages rather than earlier. It is not necessary to replace a population to change the language. How did England get Wales, Scotland and Ireland to speak English (in modern times)? As for earlier times, typically adult men were killed, women enslaved or used as wives for the invaders and children enslaved. The invaders’ language would be forced on the survivors. As the enslaved children grew up they would quickly sense which was the most desirable language. It’s nice to get a genetic map that correlates so well to the founding stock of the American Nations. no, i don’t think that can be the reason. the genetic studies here are really finely tuned. this is something i should’ve said in the post: the differences between the subpopulations that the geneticists are detecting here are very slight. they make a point of saying this in the paper — on the whole, the peoples of britain are very closely related. Very interesting, but one thing I find amazing is that in the pdf file they have stated that FRA-17 represents a migration from France later than the early peopling of Britain but pre-Roman, yet they don’t suggest that it could represent those who spread the Celtic languages into Britain. To me this looks like evidence for that conquest, as against the idea that the languages came into the Isles through trade (has any language EVER become the dominant language in an area this way?). It’s too late to do anything about it now, but it would be nice to know where they came from. That must have been one heck of boat ride to cause all that genetice divergence between the Cavaliers and the Yankees. If they are supposed to have spoken a precursor to Welsh then ok. The problem remains that English is supposed to have evolved from Anglo Saxon, and yet we have a study that suggests Anglo Saxons were not a replacement population. The people of the British Isles are very closely related, and it seems to me that they are hardly likely to adopt the language of assimilated immigrants and forego the language they previously spoke. It would have been much more likely that we all end up speaking a form of Welsh to this day. As a comparison – the Philippines had Spanish and then English as their administrative languages as a result of Spanish and American involvement in their culture. But the people there still speak their local languages, be that Tagalog, Visayan, Waray or some of the other variations that exist on those islands. Even after the duration of Spanish rule there only exist some Spanish loan words in the various indigenous languages which have been Philippinized (for want of a better term). The English loan words stick out like a sore thumb because they are relatively recent and are not altered in any way. Whereas, in the British Isles, the case is supposed to be that almost the entire population ditched Welsh or other languages in order to speak English. English has absorbed Latin, French and Greek loan words in large numbers, but nothing much in the way of Welsh which apparently everyone spoke before English. Why not? Should not English be comprised of a huge number of Welsh words even if in an Anglicized form? An alternative would be that the population of the British Isles spoke a precursor English from the Ice Age because they were basically the same people across all the islands, and various immigrants or invading armies across history brought with them their own languages which contributed loan words but ultimately the languages of the immigrants and invaders died out because the majority spoke a form of English. The latter view kind of makes the internal strife in the British Isles over the years somewhat tragic. It was a replacement population where it was a replacement population. And it was those areas which formed the nucleus of the future state. Can you elaborate on this a little. I think the study says that they did not replace the native population, rather intermixed and the Anglo-Saxon part ended up being as low as 10%. It seems to me that the name, “Ango-Saxon” was adopted, but the population was overwhelming derived from the existing population. One of the points I have made is regarding ruling or administrative elites. History is generally the study of the transition and duration of these elites. The Anglo Saxons were an example. They did not replace the population but did replace the previous administrative elite, basically the Romans. Now these elites may indeed use their own languages because it suits their purposes and convenience. But the general population does not make such a transition. They go on as they have before. The Romans came and went, the Anglo Saxons came and went, and the Normans. The Romans left Latin, the Anglo Saxons left Anglo Saxon and the Normans French. But English endured all through that. Loan words from each of the elite languages were added because the general population had some exposure to each, but essentially English retained its character because the majority of the population spoke it and used it in everyday life. When the general population started to gain more power, the administrative language became English, but no one had ever written English before, so you get a weird looking transition into something we would recognize today which was mistakenly traced to Anglo Saxon. So, the general population are, with small additions from other immigrants, essentially the descendants of our Ice Age ancestors that left Doggerland and the Celtic Shelf when the sea level rise inundated those lowland areas and forced those populations to higher ground and the islands as they are now. “England” was constructed from the south and east so a replacement population in the south and east (more likely 50/50) followed by gradual expansion from that base incorporating the rest piece by piece. Same thing in France, “France” was constructed piece by piece from it’s original base in the Ile de France gradually incorporating Bretons, Gascons, Burgundians etc over time. Disagree. Pre-war academics wanted to magnify the Germanic element and post-war academics try to minimize it. I think you need to adjust for political climate and doing so always leads to about 40:60 imo. Despite my statement above I mostly agree with this. Again the politics have always been focused on how these two populations: Germanic and Celtic, were genetically very distinct whereas in reality they were always very closely related genetically, just culturally distinct. so what i mean is in both cases the language of the base region didn’t need to dominate everywhere at once. then you might possibly start to imagine the three way split of the core zone into the SE England Empire, the Ile de France Empire and the Aachen Empire started between 600-ish to 800-ish. The adoption of the Anglo-Saxon culture was relatively easy and painless. Even when the Anglo-Saxon genetics dipped way below 50% it continued apace. That fits neatly into a certain schema. I like it. I am skeptical of the viewpoint of this piece by piece replacement hypothesis. Not of the idea that an Anglo Saxon elite would seek to gain more land and more influence and more wealth, but that they managed to teach all the supposedly Welsh speaking locals Anglo Saxon, managing somehow to get those locals to extinguish all the Welsh words they ever knew, and the Latin loan words from Roman occupation, and render the Anglo Saxon language cleansed before then, in an unprecedented change to any language ever, somehow morph it into early modern English, so that it could absorb Latin by means other than a 400 year Roman rule. They only had a few hundred years to do this, in a relatively primitive world without any of the trappings of the modern world by which such a pointless feat of social engineering could even possibly be accomplished. I certainly don’t think it was accomplished by the Anglo Saxons. The alternative makes more sense. The locals always spoke English and the Celtic speakers were other immigrant populations, probably of Mediterranean origin, escaping the troubles between Carthage and Rome. It was like ripples in a pond. However, instead of diminished energy it was like a tsunami at the end. People didn’t wait on the hybrid grandchildren; they flipped themselves. The numerous Brythonnic Kingdoms were never united so they got conquered one by one. I think there was population replacement along the south and east coast but only elite replacement in the west so yes I agree the totality of the language replacement is odd. Perhaps manorialism had something to do with that also – or the viking attacks changed the “us” and “them” dynamic from Briton vs Saxon to Briton/Saxon vs Vikings? Anyway, I don’t know, you could be right. Maybe if they released the data people could answer these questions for good one way or another. I am not skeptical of the Anglo Saxon takeover. The Anglo Saxon immigration is there in the data, and I have just seen, supported further, very clearly, by burial sites. That is not controversial at all. I am skeptical of their ability to supposedly completely purge Welsh and Latin from the population as well as somehow over several hundred years keep their language pure, but then somehow let it all go haywire and morph from a language that is completely unrecognizable as English, to a few hundred years later when it is. This sort of thing has never happened in human history. And so it has to be wrong. It should be noted that the Romans were the most advanced people in Europe back then. The Anglo Saxons by comparison were barbarians. So, these supposedly Welsh speakers all over Britain are supposed to have been less an advanced people than the Anglo Saxons even after exposure to 400 years of Roman influence, and then given up their language and culture in favour of a minority of relative barbarians when they decided to take over by force after the Romans left. It does not add up. The Romans did not manage to socially engineer the destruction of the language these locals spoke, but the culturally inferior Anglo Saxons did it easily in an unprecedented feat in human history. Alternatively, the Celtic peoples are immigrants in the British Isles that arrived by sea to the west coasts of Ireland and mainland Britain probably during the Punic Wars because they already knew the British Isles existed, and may well have traded with them, especially for timber, a naturally occurring bronze from Cornwall (one of only two sites in Europe that is naturally occurring ore in the proper mix) and other metals, probably silver and gold. They were a significant minority with no notion of military conquest, merely asylum seekers looking for a safe haven to live peacefully, and they lived autonomously and used their own written language as their administrative language. The Anglo Saxons arrived after the end of Roman rule in mainland Britain by the South East of what is now called England and took over by force, just like the Romans did. But, like the Romans, the Anglo Saxons had no means whatsoever to socially engineer the language that the locals spoke. Nor did they ever consider doing so. They used their own language for administrative purposes and convenience. The locals picked up Latin words from the Romans and picked up Anglo Saxon words from the Anglo Saxons, and simply, English, at least a language of the British Isles since the Ice Age, continued to evolve. It then went on to add French from Norman influence and as the trappings of the modern world took a grip, the language became formalized with additions of words from other languages. The above satisfies both the genetic homogeneity of the British Isles and accounts for the influence of immigrant groups. It explains why the Celtic languages died out, because they were not indigenous and spoken by the majority, and why English is extant throughout all the islands of the British Isles. The dominance of English is an incredibly odd phenomenon, especially if there is supposed to have been an entirely Celtic British Isles beforehand. The data shows the Anglo Saxons were not a replacement population. It shows also that there is no consistent Celtic population either. One wonders here if the Ulster Scots show up as a group that were not influenced in any major way by either the Romans or the Anglo Saxons or the Celtic groups, and so may be the last of the original English speaking Ice Age population. I was under the impression that English derived from the language of the Angles. Is that not the case? Anglo Saxon is supposed to be the language English evolved from, but for that to be the case a lot of very odd things have to be true. The only real way for the Anglo Saxons to enforce such a change in language would be as a replacement population. But we clearly have data that shows this is not the case. This is further compounded by the fact that it must have occurred after a purge of Welsh and Latin by the Anglo Saxons, pure Anglo Saxon then being spoken, and then the extremely rapid all new addition of Latin minus Welsh, to the evolve in to early modern English over a couple of hundred years. The supposedly prior population, the Celts, also appear to not have been one group at all but several different ones with some language similarities. Yet the language of the locals was apparently Welsh. Languages are very resistant to change and in many respects are attached to the peoples that speak them in a fundamental way. Even the languages of small populations can survive for very long periods against great odds. So, for English to be a language spoken across the British Isles, despite all the political and ethnic divides does not really stand up to scrutiny. Above I mention the Philippines as an example. A population ruled by the Spanish and Americans. The Spanish additions to the various Filipino languages are obvious if you know Spanish, and the English ones stick out like a Rastafarian at a Ku Klux Klan meeting. It is actually quite humorous to hear the context in which the English additions are used, because it is obvious how they came to be used. Technological development has been a feature of the English speaking world for many generations. For the Filipinos it is relatively new. There are no useful words in their languages, and it was quite simply much easier for them to take English words when words in their own languages were not suitable. The Filipinos have been subject to English in a modern context of schooling, and it was even mandatory for a while, but they keep on speaking the various indigenous languages and dialects despite the enormous pressure from formal schooling and, quite frankly, immense American cultural influences. The effects of Roman culture on the supposedly Welsh speaking population of Britain, prior to Anglo Saxon arrival, would have been somewhat comparable. Yet the Anglo Saxons supposedly arrived to a Welsh speaking population that was exposed to the greatest and most influential culture of Western Europe for 400 years or so, and yet the Anglo Saxons wiped it all out, replaced it with pure Anglo Saxon, which then morphed into English over a few hundred years, with the Latin added all brand new, minus any traces of Welsh, despite the fact that the population was supposed to have spoken Welsh previously. So, certainly it seems like the genetic evidence supports a different viewpoint. We know the population of the British Isles are very closely related. And we know there were a number of immigrations. Takeaway the Celts as indigenous and the Anglo Saxons as the origin of the language and a lot of problems go away. English or its precursor was spoken at least from the Ice Age, and one could probably source it, and its similarities with other North Western European languages to them being one of a source population around Doggerland and the Celtic Shelf, basically the Ice Age lowlands. As a Devon-born lad, I can tell you we always knew those Cornish bastards were different. The Romans acted as administrators and along with soldiers (from diverse regions) didn’t engage in genuine colonialism… unlike their adventures in Gaul and Spain. Hell, at that point, there were barely enough actual Romans to go around. Compare this to Anglo-Saxon invasions which brought entire families, tribes, unions etc with their own language and it’s not really that strange a phenomenon. Another inverse example is when immigrants move to an English speaking country. The children might learn both languages, but they keep them separate. They don’t start inserting Greek (for example) into English. The native Britons at some point just switched because it was to their benefit. They were also far less “unionized” across the land and not stubborn enough to retain their older language.